Let us not forget hospitality! 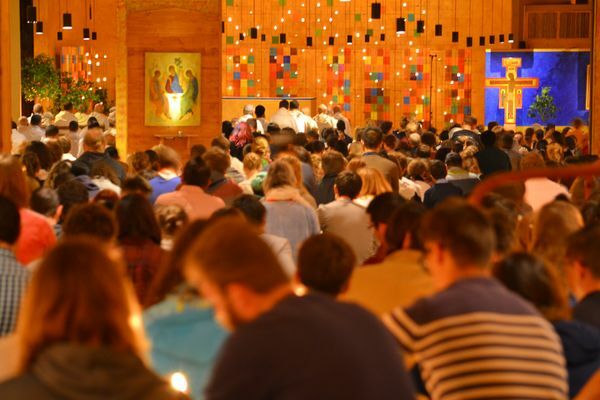 The pilgrimage of trust, an uninterrupted succession of meetings of young adults which began in Taizé several decades ago, continues today on all the continents. In each of these gatherings, one of the most memorable experiences is hospitality, both for the young participants and for those who open their doors to them. In August 2018, we were able to gauge once again the value of hospitality in Hong Kong, during a meeting of young adults from countries throughout Asia and beyond, including countries that have been in conflict and which are still marked by the wounds of history in need of healing. Seven hundred of the participants came from different provinces of mainland China. The presence of young people from so many countries and the welcome they received in the families of Hong Kong was a sign of hope. The young Christians of Asia are often small minorities in societies undergoing rapid change. They attempt to draw strength from their faith in Christ and by living as sisters and brothers in the Church. From the European meeting in Madrid onwards, throughout the year 2019, in Taizé, Beirut, Cape Town and elsewhere, we will be reflecting more deeply on several aspects of hospitality. The following proposals are rooted in faith; they invite Christians to discover the source of hospitality in God. This leads us to question the image we have of God. God never excludes, but welcomes each person. My brothers and I see that the experience of hospitality involves not only Christians from different Churches, but believers of other religions and non-believers as well. In the midst of present difficulties, when mistrust seems to be gaining ground, will we have the courage, all together, to live lives of hospitality and so allow trust to grow? From the beginning of the universe, God has been mysteriously at work. This conviction is at the heart of the poetic stories of creation at the beginning of the Bible. God contemplates what he brings into being and blesses it: God sees how the whole of creation is good. The entire universe is deeply loved by God. Sometimes we understand so little about God, but we can go forward in the confidence that God desires our happiness and welcomes us all, with no preconditions. God is the source of hospitality. Still more, through Christ, God went to the point of becoming one of us, in order to draw humanity to himself and to welcome us. This hospitality of God towards us touches the depths of our souls: it overflows and goes beyond all human frontiers. • In the face of the perils that weigh upon our time, are we seized with discouragement? To keep our hope alive, let us practice a spirit of wonder, looking around us with eyes that discern everything that can be admired. • Alone or with others, let us read the Bible, beginning with the Gospels that tell the story of Jesus’ life. We may not understand everything at once; sometimes we will need to find out more. Going together to the Bible as to a spring of living water will help us grow in trust in God. What does this parable that we find in Luke 15:11-32 teach me about God’s hospitality? God offers us hospitality, but it is by our free response that it becomes a true communion with him. Jesus shows us that God is love, offering us friendship. Humbly, Christ stands at our door and knocks. Like a poor man, he hopes for and awaits our hospitality in return. If someone opens the door for him, he will enter. By a simple prayer, we give him access to our hearts. Then, even when we hardly sense his presence, Christ comes to dwell within us. • Praying in a church, even for just a moment; setting time aside, in the evening or the morning, with no other purpose than to entrust our day to God—these are things that build us up inwardly over time. Recalling the presence of Christ also frees us from our fears—the fear of others, the fear of not being good enough, worry in the face of an uncertain future. • When we do not have much time, we can speak to Christ about ourselves and others—those nearby and far away—in just a few words, as in a whisper. We can tell him what is in us and what we do not always understand. A few words from the Bible can also remain with us throughout the day. What helps me to hear Christ? What does it mean for me to “open the door” to him? God welcomes everything in us; in our turn, we can accept ourselves just as we are. That is the beginning of a healing that is so necessary for us all. Let us praise God for our gifts. Let us also welcome our frailties as a door through which God enters us. To lead us further, to help us to change our lives, God wants us first of all to be welcoming towards ourselves. Accepting our limitations does not make us passive in the face of injustices, violence, and the exploitation of human beings. On the contrary, consenting to our limits can give us the strength to struggle with a reconciled heart. The Holy Spirit, a fire hidden in the depths of our being, gradually transforms everything in and around us that is opposed to life. • In order to discover our gifts and consent to our limitations, let us look for someone who can listen to us with kindness, someone who helps us to grow in life and in faith. • It is essential to make room for praise in our prayer. It unifies our existence. Prayer sung together is irreplaceable; and afterwards, it keeps on resonating in our hearts. What burden and what rest is Jesus talking about? What can I learn from him? To share our trust in God with others, we need places where we can find not just a few friends we know well, but a friendship which is wide enough to include those who are different from us. Parishes and local communities bring together different generations and people from diverse social and cultural backgrounds. There is a treasure of friendship there, one which is sometimes too unexplored and which needs to be made good use of. If every local Church were like a welcoming family, where we can be ourselves, with our doubts and our questions, without the fear of being judged…. The Church is found wherever the wind of the Holy Spirit blows, wherever the friendship of Christ radiates outward. In some countries of the South, there are small grassroots Christian communities which make a far-reaching commitment for others, in their neighborhood or their village. Could they be a source of inspiration in other countries? • It is good to meet together regularly in small groups for prayer and sharing, but let us also support the life of the larger Christian community that exists in our town or village. Could our small group be attentive, for example, to those who come to the Sunday service but do not know anyone there? • Christ wants to gather into one communion all those who love and follow him, beyond their denominational affiliations. Shared hospitality is a road to unity. Can we not invite those around us who express their faith differently to pray together with us more often than we already do? At the foot of the cross, a new family was born by Jesus’ own wish. How can we live today as sisters and brothers? God’s hospitality to us is an appeal. Can we receive others, not as we would like them to be, but as they are? Can we let ourselves be welcomed by them in their own way, not in ours? • Let us become women and men of welcome, taking the time to listen to someone, inviting them to a meal, approaching a destitute person, having kind words for those we meet…. • In the face of the great challenge posed by migration, let us look for ways in which hospitality can become an opportunity, not just for those who are welcomed but for those who welcome as well. Person-to-person encounters are indispensable—we could listen, for example, to the story of a migrant or of a refugee. Meeting those who come from other places will help us too to understand our own roots better and to deepen our identity. • We need to take care of the earth. This marvelous planet is our common home. Let us keep it hospitable, also for future generations. It is important to review our lifestyles, doing all we can to stop the mindless exploitation of resources, and to combat the various forms of pollution and the decline of biodiversity. When we are in solidarity with all of creation, we will discover the joy that flows from this. When have I ever had the experience that giving brings happiness? Am I aware that I also need to receive something from others? "Proposals 2019" in Asian languages.